Brand new band out of Paris, Cheap Riot, can’t find much on these guys except a Facebook and those French classes in high school aren’t helping much. I know this is their first single and that Requiem Pour Un Twister have put out cool stuff in the past so I’m in. Now I’m looking up Croque Madame Records which I’m guessing is the French equivalent to Burger Records? 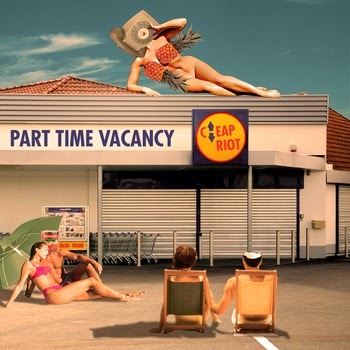 A-Side’s “Part Time Vacancy" has a nice sparkly jangle from a picked electric with a heavy tempo snare and high range vocal from a rehearsal room sound. The vocals pile right over this thing. The snare has trouble keeping time in the changes with the right amount of looseness like The Beets and their nerdy laid back sound. Even when they start to get rough in the chorus they’re likable guys that keep going back to that 4/4 steady rock. Still all guitars, no denying that, in 360 degree garage treble sound. Real pop that starts to degrade in metallic reverb and turn into part time lover and part time punk. O”n B-Side’s Man of That Kind" the vocals go solo hoarse and take over the mic, just stepping up to this garage layered sound. Just saw the trailer for that Belle and Sebastian musical coming out that I'm actually excited to see and all I can picture is the lead in that delivering this vocal. Somehow it has that Scottish ‘50s garage soul reverb heavy stuff. He's earnest, cracking vocally, but the high harmony makes this sound like that pop punk stuff. They get into the honest sonics from 40 years ago that Shannon and the Hunx have been fracking. Get it from Croque Madame - or Requiem Pour Un Twister.